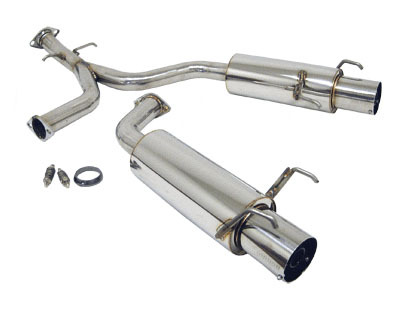 For those who like to tailor their exhaust to their own taste, Megan Racing offers an axle-back exhaust for the Lexus IS250/350. Designed as a direct bolt-on to replace the stock piece, this axle-back system works in conjunction with the OEM Mid-Pipe and is easy to install within minutes. The IS350 is fun to drive in stock form but the factory exhaust system can leave much to be desired in terms of sound and performance. The factory axle back exhaust was not designed with optimal performance in mind. Megan Racing???? ?_s axle-back exhaust offers a solution to these problems. Megan Racing???? ?_s axle-back exhaust increases both horsepower and torque by replacing the stock unit with a smoother less restrictive unit. The increased exhaust flow will give your IS350 a more aggressive tone that will set you apart from the pack. This exhuast features 2.5" piping and a dual 4" tips.